Home by Ally: Quick Tip! Hope y'all are doing well. I've been really busy this week working on a few new pieces of inventory to show y'all and put up in my shop. But here's a quick tip that I use for organizing my purses. I went to the Dollar Tree and for $1.00 I bought white plastic shower curtain rod hooks. 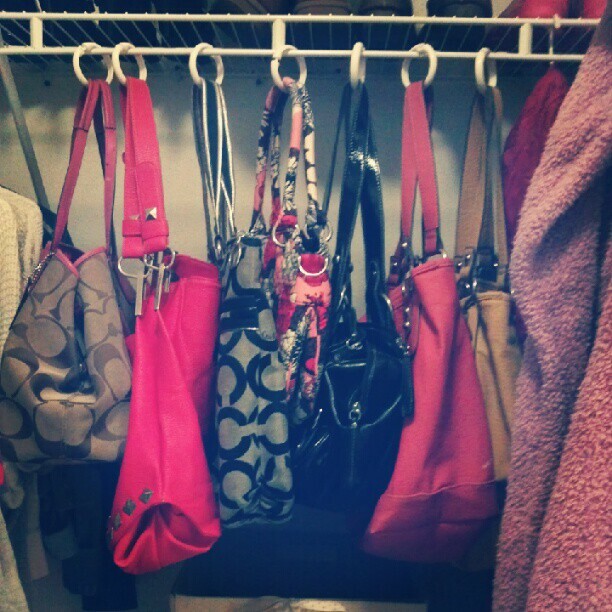 I simply put the purses on the hooks and hung them in the closet just like they were clothes. So much more organized than having them thrown at the top or bottom of the closet! Don't you agree? I have a lot of news coming up for y'all and a lot of big things in the works that I can't wait to share with you! Please stay tuned for more information! If you haven't started following me on Instagram, you can find me at @allyschmidheiser. And if you haven't LIKED my page on Facebook, please do so here!